Happy Friday, all! 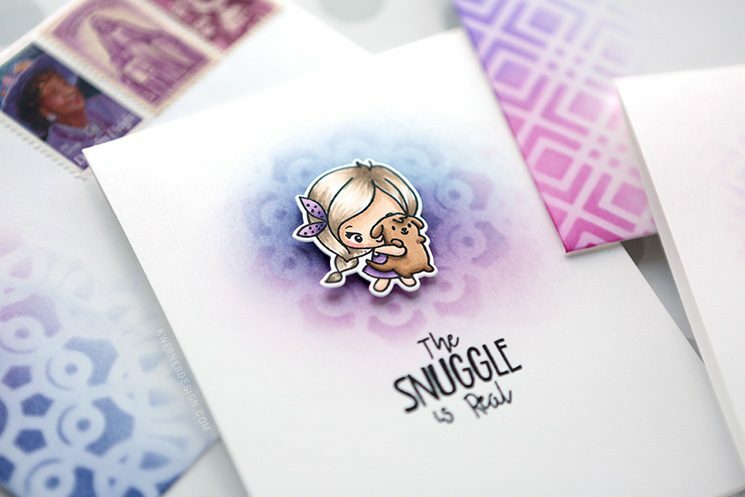 :) Today I wanted to create something with the adorable Hey Pretty Kitty and The Snuggle is Real stamp sets from The Greeting Farm. I’ve had these in my stash for a few months and recently “unearthed” them (anyone else’s craft room out of control? LOL!). 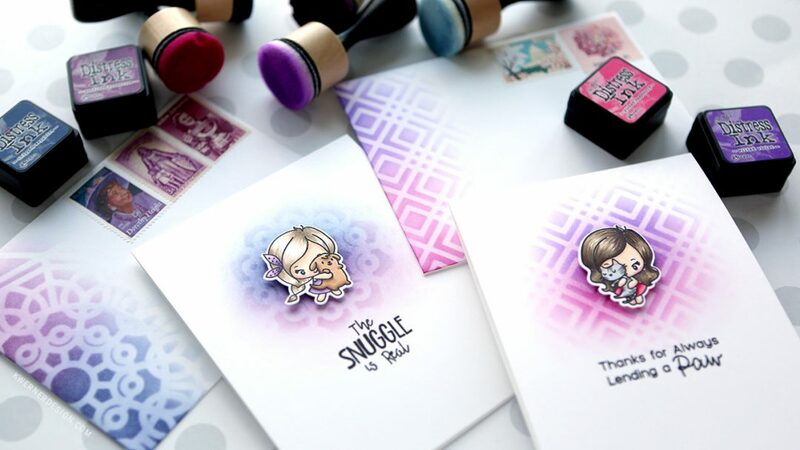 I thought the smaller people images in the stamp sets would be perfect for some center ink blending! And adding stencils into the mix adds some patterns and interest, too. Before creating the ink blended backgrounds, I created the elements to go on top (so I could get the spacing right on the card front). I stamped one image from each stamp in black Copic-friendly ink on white cardstock, and then colored the images using Copic markers. 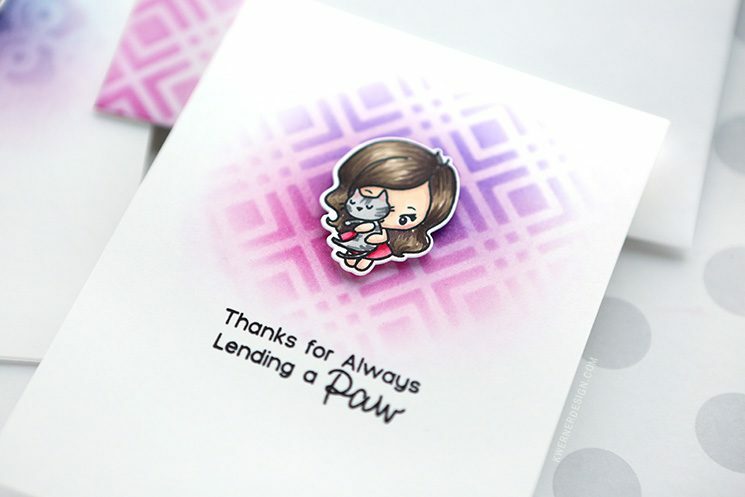 Then I die cut each image using the Hey Pretty Kitty and The Snuggle is Real coordinating die sets. 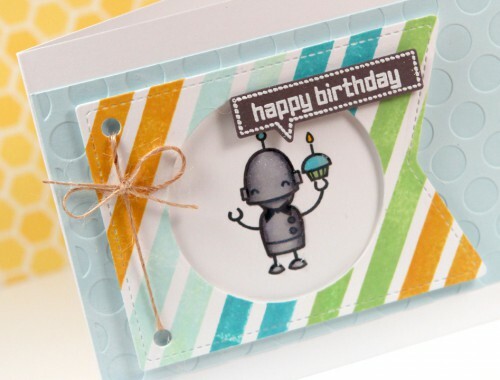 To get the placement of the greeting just right, I placed each die cut onto the card bases and then stamped the greetings in the same black ink. Then I marked where the die cuts would eventually be adhered, and started blending using different Tim Holtz Distress Inks (see the exact colors below). The used two stencils to add patterns to the blending as well–the Radiant Stencil from Simon and the Square Dance Stencil (also from Simon). While I had the stencils and inks out, I also created envelopes to go with each card. See this page for info on the vintage postage stamps I used.